FRESNO, Calif. (KFSN) -- The California State Assembly honored National Spelling Bee winner Ananya Vinay on the floor at the State Capitol Monday. Vinay was joined by Assemblyman Jim Patterson (R-Fresno). 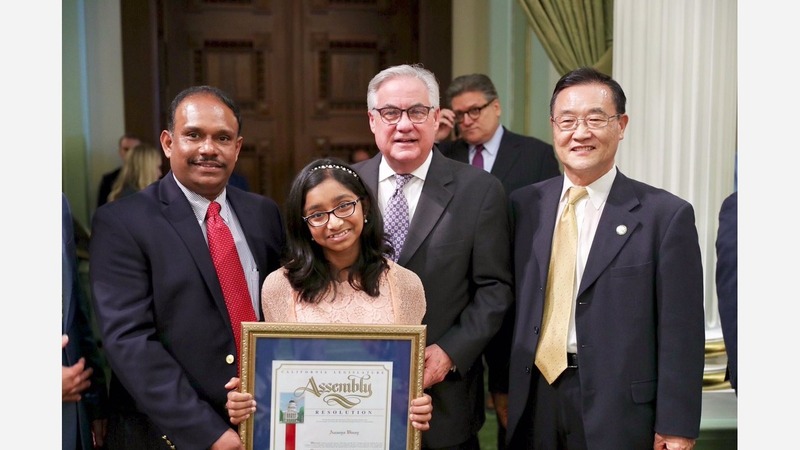 After receiving the honor in the Assembly, Ananya headed to the Senate to be honored by Senator Tom Berryhill. Sacramento is the most recent stop on the 12-year-old's victory tour. She has made appearances on the 'Jimmy Kimmel Show' and 'LIVE with Kelly and Ryan.' She was also whisked away to Oakland to watch her favorite team, the Golden State Warriors, in a playoff game.